So the meal at your wedding is finished and it’s time for the wedding toast.. Your DJ/Emcee has just announced that toasting is to begin. You think to yourself, “I sure hope John won’t say anything inappropriate”. How do you prevent this from happening. It’s simple. Talk to your potential toasters and give them some guidance. Here are some suggestions on how to create a perfect wedding toast. The best man, maid of honor (or matron of honor) traditionally toast at a wedding. Fathers of the groom and bride, other family members also usually join in. But opening up the toasts to the guests are sometimes encouraged. In fact, in some cultures, having each table provide a toast is part of the reception tradition. Using your DJ/Emcee as a host can help keep the wedding toasts flowing. WHEN ARE THE TOASTS GIVEN? 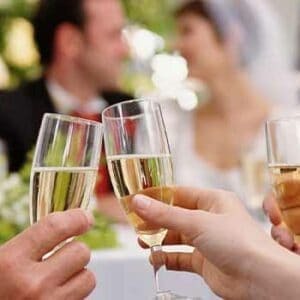 In formal weddings, toasts are given after the meal, usually before the formal dances. For less formal affairs, toasts can occur after the first dance, before or after the cake, or virtually anytime that feels right to you. Just be sure to have a timeline of events so everyone is on the same page. 1) BRIEF. The best advice for any toaster is to keep it as short as possible. A toast of even just a couple of heartfelt sentences is completely adequate. Speaking for two to three minutes should be the maximum—and plenty of time to say what you need to say. 2). CLEAR HEADED. An open bar isn’t your best friend until after the toast. While one drink can calm you, remembering your own limits will make your toast memorable for all the right reasons. You don’t want to be remembered for slurring your words. There will be plenty of time for celebrating after the toast. 3). PRACTICED. If you are not an experienced public speaker, practicing your toast can help you be ready for your big moment. In fact, most experienced public speakers have practiced theirs. Have someone listen to it and give you an honest opinion. 3). COMPLIMENTARY. Your toast should compliment the couple and be sincere. Adding a touch of humor is good, but unless you are a professional comedian, use it wisely. All those fraternity or sorority experiences that were hilarious after a few drinks might not be the proper content for your toast. If you have been asked to give a toast, it is an honor. Give the guests what’s in your heart and you will give a successful toast. 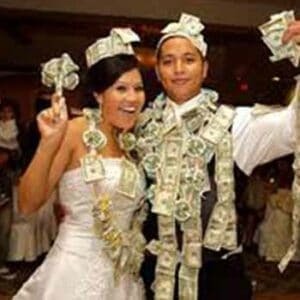 As a wedding dj/emcee, we take the time to speak to your toasters before the toasts. We help them with the proper way to hold a mic, and generally organize them to create the perfect wedding toast experience. Call us today and let us help you plan the perfect reception.